Heating water in the kettle takes a fair amount of energy and time, we came to the realization that we could use about 1/4 the energy to have the same volume of drinks/soups etc.., over the period of a day, if we used an airpot. We now heat water two to three times a day, rather than every hour or two, because of using an airpot. It is also much more hip with today’s lifestyle of instant gratification with a large dash of energy conservation and green living. Hot water on tap any hour of the day or night. If your on watch it takes just a couple seconds to make a cup of something hot as opposed to having to heat water to make it. The below reviews are the accumulation of about a decade of experience using different products and continually refining what worked and what didn’t for us. There are many products out there that we have not used and I can not comment on how well they would work, but these I have experience with. This model kettle holds exactly the right amount of water to fill this specific airpot, so they work well together that way. To slightly overfill the airpot I have to seriously overfill the kettle, which ends up causing a mess anyway. 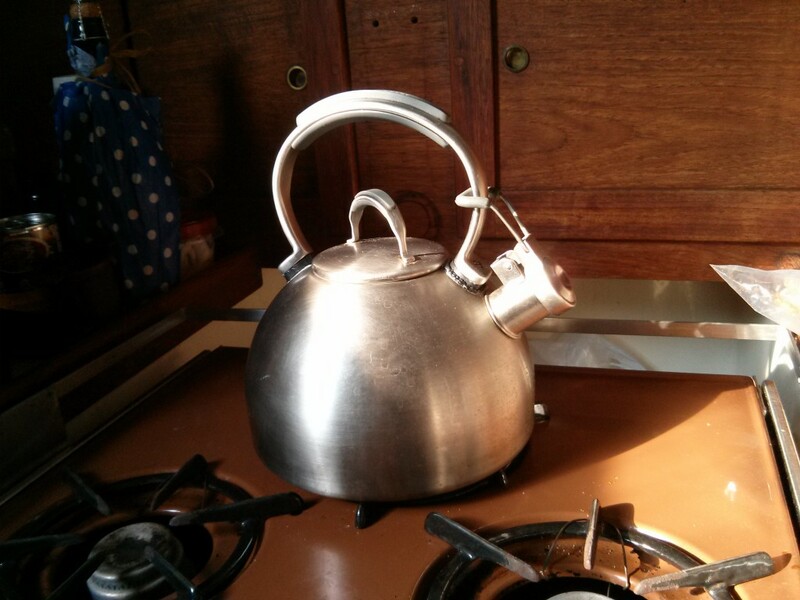 If you over fill the kettle that much it will bubble out the spout as it is heating and starts to boil. So I happened across this kettle that we have been using for the last three years on amazon and decided to write a review of it there. Then I thought you guys might find it valuable as we have found it to be a great product at the house and on the boat. As you can see from the below picture it fits the burners perfectly on the Hiller Range for those of you still using the original stove on our boats. I got this Kettle for free from a store that someone had returned it to (Ross, I think). It had been burned, and the store policy was that they couldn’t sell returned kitchen stuff, and someone had mistakenly put it back on the shelf. I really liked the heavy weight of the stainless and the design. So I started working up through the store ranks trying to convince someone to sell it to me for a slight discount due to the cosmetic damage. I am all about a bargain if I can get it, and if you don’t ask you for shure are not going to get it most of the time. 🙂 I finally worked my way up to the manager who told me the policy of not selling returned/used kitchen products, and she didn’t know why it was on the shelf at all. At this point I was alarmed as I wanted it and she wasn’t even going to sell it to me for full price. After a plea or two or three or maybe even four (persistence sometimes works) she firmly told me that she wasn’t allowed to sell it, but if it disappeared out of her sight quickly all would be good since she was going to throw it away anyway. I didn’t argue any more, just said thank you, thank you, thank you, and ran before she could change her mind. If your reading this, thank you again. 🙂 When we got it home I used an aggressive scotch bright pad to clean it to a like new appearance. It took a little elbow grease but it was worth it. We have used this kettle now for about 3 years. I have overheated and burned it due to forgetting to put the whistle down. Once, it overheated to the point that the plastic spacers between the handle and the body started to melt. It did not deform the stainless body, handle, or whistle at all, and a quick scrub with a scotch brite pad cleaned up the burn marks inside and out till it looked like new (you have to love scotch brite pads). As for the handle I simply tightened the screws to snug it back down to the base; on the now slightly thinner, by reason of melting, plastic spacers. That was at least a year and a half ago. It is till going strong. I have overfilled it hundreds of times and had water bubble through the whistle and it still mostly whistles as long as water isn’t currently flowing through it. 🙂 I will admit that it doesn’t seem to be as loud nowadays as it used to but it still works. We live on a boat in a salt water environment and I have never seen the first sign of rust on ours like some reviewers on amazon have reported. It has been used with water from the well at our house, that is treated with a water softener and filter, and with municiple water at the dock where our boat is. We filter that water before use for drinking or cooking also. At the house with a reverse osmosis filter there is never any build up of residue over time. At the dock on the boat with municiple water filtered through a seagull filter we do get a bit of residue build up after 3 or 4 months of use, still we have seen no rust either internal or external. I have used it on both electric and gas stove tops and it works well on either. With gas the handle can get hot if you have a huge burner and turn it on high. Otherwise we can use it bare handed. Like other reviewers have said, if you have an issue with the handle getting to hot to hold, just turn the gas burner down a little bit till the handle is still cool after boiling your water. The handle with its silicone inserts is probably the best handle out of the many kettles I have used. Most of the high quality stainless kettles I have had in the past had solid metal handles, and often had to be handled with a towel, or oven mitt, to pour from as they got quite hot by the time the water was boiling. So far, out of five or six different brands of kettles, this has been one of the most durable ones I have ever owned. We use it on average 3 times a day, 7 days a week, 365 days a year. Hey we drink a lot of hot drinks! 🙂 So far that means that we have boiled about 3285 kettles of water in it since we bought 🙂 um-mm.. or should I say acquired it. I am not sure if they still build them like the one I have here but the pictures look identical to ours. Ours is stamped (18/10 Stainless, 2QT/1.9LTR, Kitchen Aid, C Q06, Whistling kettle) on the bottom. 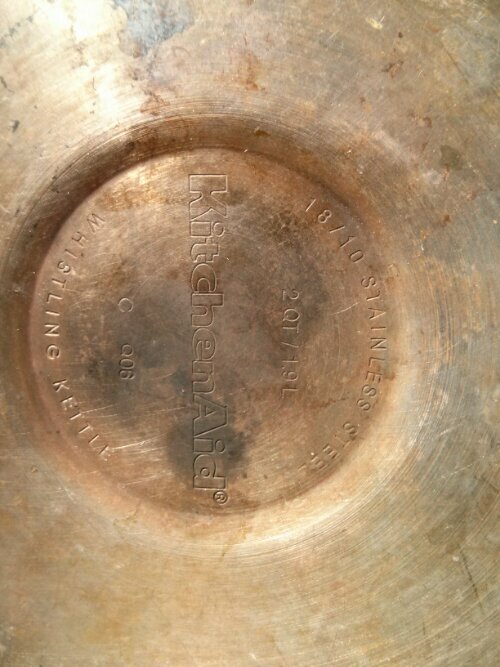 So this is the bottom of the kettle with the manufacturing information stamped into it. I have loved this kettle for the heavy compared to most kettles construction. I have had several kettles that the stainless is just super thin. This has a very decent weight grade of 18/10 stainless. On the boat when in use the kettle sits on the stove as pictured above, but as soon as we finish heating the water and it is poured in the pump pot that is hanging to the left, we then hang the kettle from a stainless S hook. See the picture below, it is hanging on the right in the picture below. It keeps the counter tops and stove much less cluttered in daily usage. The kettle is always empty hanging but the pump pot seen on the left in the below picture, is normally full of hot water on its hook, and can be pumped into a cup or bowl while it is hanging. 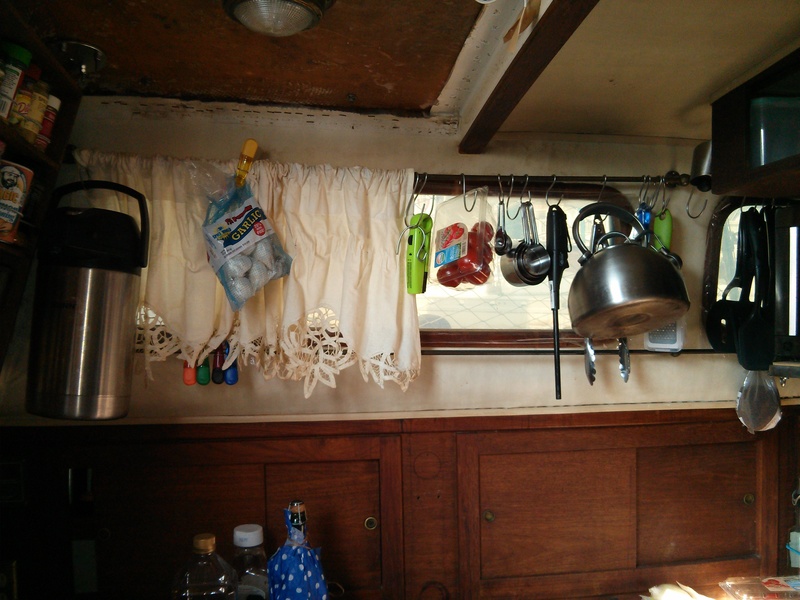 When underway we can use a little bungee to hold the pump pot and kettle against the bottom curtain rail. Both the pump pot with water in it and the kettle as well as other stuff pictured here hangs from bronze curtain rods. Here is a link to this kettle on Amazon (sadly is is a discontinued product now but you can still see it at the link. Here are a few other highly rated kettles that would make awesome boat kettles Some even better than the above one. In no particular order here they go. Here is the pink one 🙂 http://amzn.to/29fTcH1 and here is the Green one http://amzn.to/29kvfVh This Kettle at 24 dollars is the ultimate in compact as it has a stainless base with silicone top that collapses down to make it very compact for storing. I have never used it but it seems to have good reviews. Try at your own risk and let us know what you think. Airpot or Pump Pot the Next Essential Ingredient. You will have noticed the Airpot hanging up to the left in the above picture. It was a long and expensive journey to arrive at that particular airpot. Many years ago, I started using a Stanley glass lined air pot that I purchased at Wal-Mart for fourteen dollars. It lasted for two or three years at the house and gave good service. However the seal at the neck was some sort of putty, and it was getting old, and pieces of it were falling into the interior, also it lost a lot of its efficiency over time. The big monkey in the room issue though was that if you dropped one (or had it bounce off the counter in rough seas, we had bought a second one for the boat) it would shatter and leave you with microscopic glass slivers that went everywhere, as well as a couple litters or quarts of boiling hot water exploding like a bomb. It was a Bad! THING!! Luckily no one was hurt when it happened to us. Today with a two and half year old daughter running around, a glass lined pump pot would give me nightmares. So the journey started into the land of stainless airpots. 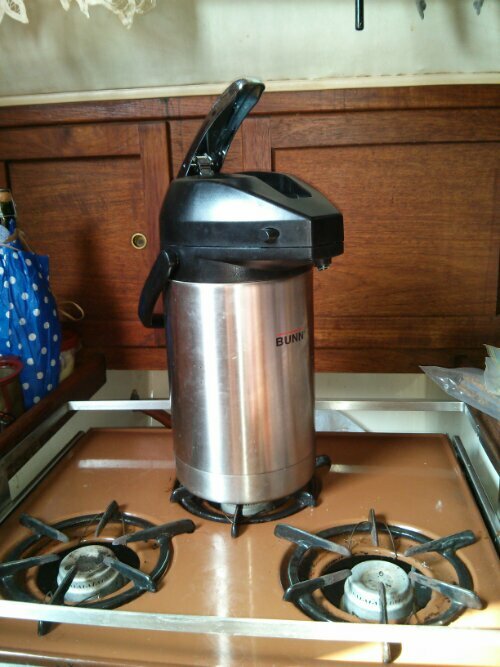 I purchased a Stanley Professional Air Pot for our boat that had a stainless liner rather than a glass one. I bought the Stanley as it was the same brand as the cheap wall mart glass lined one that worked quite well for the most part. It worked very well, and we liked it a lot, but something happened to it (don’t remember what right now) that we needed to replace it after a year or two, and we couldn’t find that model again. The reviews for the other Stanley models were not as good as the old one so we passed on them. The next one we purchased was a Trudeau Apollo 2-1/5-Liter Stainless Steel Pump Pot, Satin Finish that we purchased from amazon, we were ultimately very unhappy with this model. We used it for several years, and over time just were on average dissatisfied with it. It didn’t hold temperature as well as I would have liked and finally the end came when for some reason it would start regurgitating boiling water for no reason just sitting by itself on the counter. This was unacceptable behaviour and we fired it. After much reading and research we bought this slightly smaller unit from BUNN, and it is everything the other one wasn’t, It keeps water hot for 8 to 12 hours without fail. I can put hot water in it at 6 or 7 in the evening and it is still hot enough to be (uncomfortably) hot to the touch 12 hours later. I also like that it is slightly shorter than many of the other units we have owned, just a personal preference. So far we have owned the Bunn Airpot for 6 months and have used it daily. It has been the best airpot we have owned or used over the last decade. However we only have 6 months of history with it so I can’t really comment on durability. It feels and looks like a solid unit to me though and it does get good reviews from other owners. The link below will take you to this product on amazon where you can read other reviews of it. I know this isn’t strictly a boating review, but these are two of our live aboard items that we feel enhance our daily life a lot. They are some of those items that are not flashy, or ooh ahh, but that when we think about them; we see that they add a tremendous amount of comfort, saved labor, and saved cost in fuel consumption for us. Actually this applies every bit as much to our usage at the house as it does to the boat. I would say that the Air Pot also enhances safety on the boat. It is a lot easier to contain hot water in it, as well as to pump out a precise amount into a cup or bowl, while bouncing around under way than it is just pouring directly out of the kettle.